JULIO AVILA CAN’T remember exactly when the tradition started, but tres leches cake has been his birthday dessert since boyhood. Maria Isidra Polanco, Avila’s maternal grandmother, was born in Colima, Mexico, and raised her five children in the Koreatown neighborhood in Los Angeles. When Avila and his brother were growing up in the San Fernando Valley, they loved visiting their grandmother in K-town. If she couldn’t make his birthday tres leches cake, Avila’s mother would buy one from L.A.’s longstanding Cuban bakery, Porto’s. “Those are really delicious too,” says Avila, who admits to a big sweet tooth. 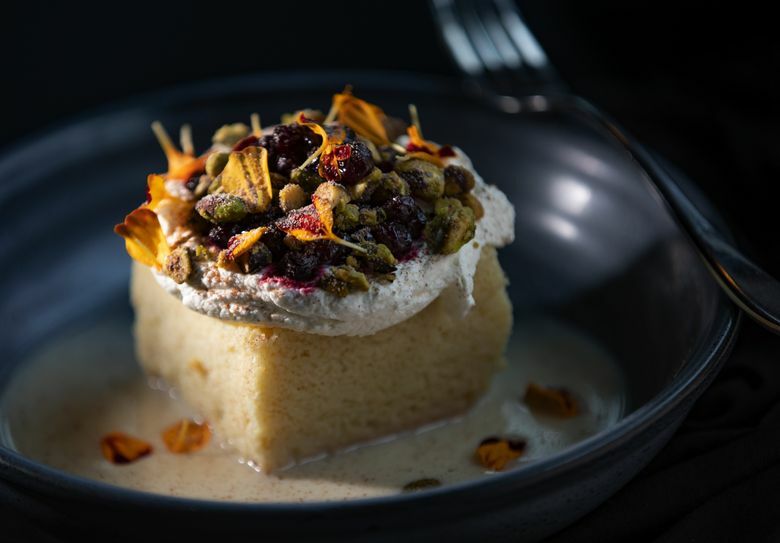 Saywer’s cuatro leches cake might not get as much Instagram love as its S’more Choco Tacos or Dilly Bars filled with chocolate-chip cookie dough semifreddo, but the cool, almost-creamy cake topped with creme fraiche and garnished with berries is just as outrageously delicious. He’s learned a lot since then. 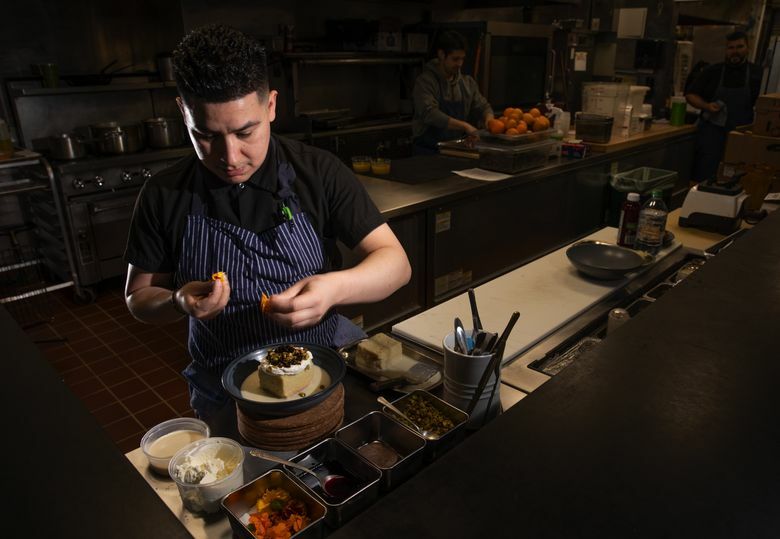 After moving to Seattle in 2015, Avila worked with John Sundstrom at Lark (where he met Mayers) and did intermittent stages elsewhere: at Cosme in New York, at Benu in San Francisco, and in Seattle at Cafe Juanita and Ma’Ono. At Sawyer, desserts are a collaborative effort. After Avila tried out his grandmother’s recipe on Mayers, they tinkered with it. “Tres leches has to be more of a pound cake, because it has to be submerged in all the milk and needs to hold its shape,” Avila says. Deciding it was too dense, they incorporated cake flour to make it lighter. It was Julio’s idea to add cream. He likes the milks to have a saucy consistency. Mayers wanted to add chocolate milk, but Avila nixed that. The compromise: grated Mexican chocolate on top. Fittingly, Avila uses Abuelita chocolate tablets, which also adds spice. 1. Preheat oven to 325 degrees F. Sift together flours, baking powder and salt. Set aside. In a stand mixer, cream together the softened butter and sugar until well-incorporated, about 7 minutes. Add eggs, vanilla extract and wine, and mix well. Gradually add the dry ingredients in three stages, making sure to incorporate well between each addition. Reserve batter. 2. Spray a 9-by-9-inch pan with nonstick cooking spray (or grease with butter), and coat with flour. Line the bottom of the pan with parchment paper. Pour the batter into the pan, and spread evenly. Bake for 45 minutes to one hour, until golden brown and a toothpick inserted in the middle of the cake comes out clean. Allow the cake to cool and rest. 3. To make the soaking liquid: Combine all the ingredients in a pot, and warm the liquid just enough to dissolve the sugar and infuse the flavors together. Let cool. 4. Remove cake from pan, trim the edges and cut into desired portion sizes. Place pieces in a single layer in a container deep enough to hold the cake and milks. Pour the soaking liquid over the cake, cover and allow to sit overnight. 5. To make the topping, whip the crème fraîche and the cream until they form stiff peaks. 6. To serve, place each portion in a bowl, and add some of the cuatro leches mixture. Top with whipped crème fraîche; grated chocolate; and, if desired, a pinch of salt. Serve, as they do at the restaurant, with fresh or preserved berries. Leftover cake can be stored in the liquid for a day or two.